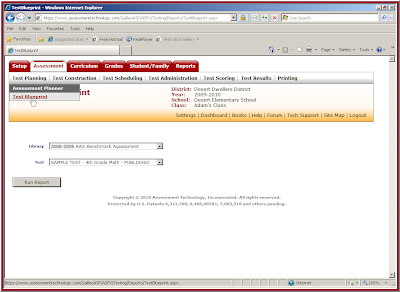 Galileo K-12 Online features a variety of test reports that can be run at the student, class, school and district level. The new Custom Test Report adds flexibility by guiding users through the process of generating personal queries to export student-level demographic and test information from the Galileo K-12 Online database. Custom Test Reports can be run for single or multiple tests, including tests spanning program years. The first step in generating a custom report in Galileo is to select the desired data fields. Student demographic information and data from external assessments such as state or national tests (e.g. DIBELS, TerraNova, SAT) are accessed via Galileo Forms. Galileo Forms can also contain fields for any data desired by the district, provided either as part of a Galileo Data Import or a separate upload. As shown, it is also possible to individually include the school, class, and/or teacher in the report. There are multiple options available for data inclusion and report generation. These are shown in the above screenshot. 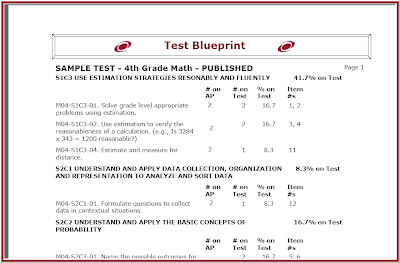 For example, a report can be generated that includes each student’s answers to test questions, and/or the correct answers. Reports can also contain cut scores, DL scores sum score, percentile, percent correct and performance levels. Once the report settings are chosen, enter the desired delimiter (the default is comma) and file name and click the ‘Create File’ button as in the screenshot below. It is not necessary to enter a file extension, all reports generated with this feature receive the .txt extension, though the data is typically manipulated by opening in Excel. A sample screenshot is shown here – the data is now ready for additional manipulation, sorting, filtering or reporting.